Today my little man was really into playing with the costumes in his costume box especially since Mommy got him some new vitamins with Superheros on the bottle so he knows that his vitamins will help him to be strong like his favorite superheros. He wanted to put on his costumes and try out his mad superhero skills that he got from his first day of taking the vitamins, he put on his Black Spider-man outfit first and had some fun in it, but it didn't last long. He wanted to be Hulk next, but couldn't find where he left the mask so he went on to Wolverine. His Wolverine costume made him really excited because he remembered that not only did he get the Wolverine costume for Christmas (from Mom and Dad), but he got a Wolverine extending plastic claw from his Great Aunt, and Uncle and his cousin so he had fun showing off his mad Wolverine skills shouting out "Ching, Ching!" the noise it makes when the claw extends. 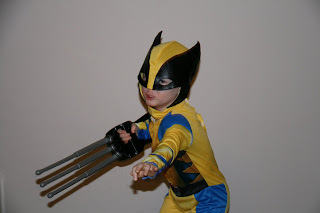 Here is a picture of my little man showing off his mad superhero skills as Wolverine!